This pretty flower would look great on any quilt. It can be made large and it looks great stitched very small. Start with three drawn lines, one inch apart. 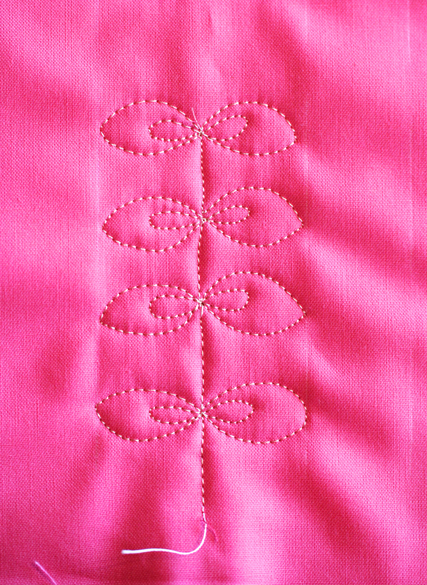 The pattern will be stitched on the center line and the two outer lines will serve as guidelines to keep our stitching straight. 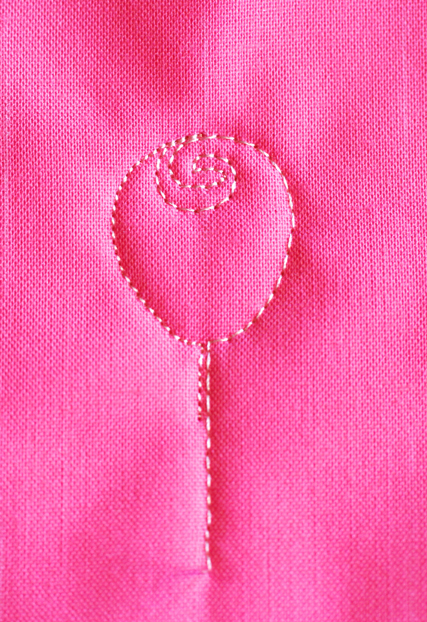 For more on spirals see the “Four Steps to Perfect Spirals” tutorial HERE. As you spiral out, finish the spiral ON the center line. STOP HERE. 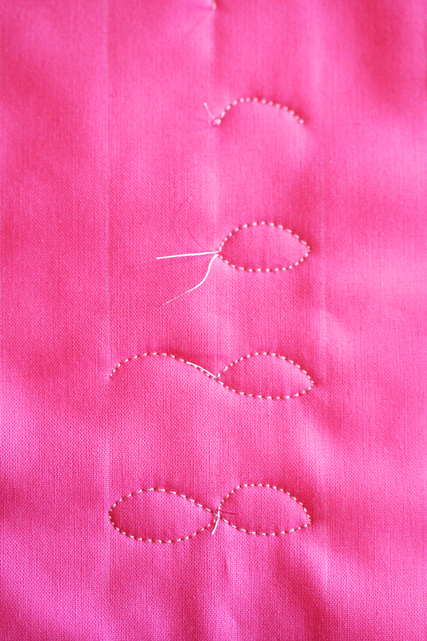 From this point, begin the next tulip by stitch a straight line up the center line. When you reach the last tulip in the line, stop at the same point as above. 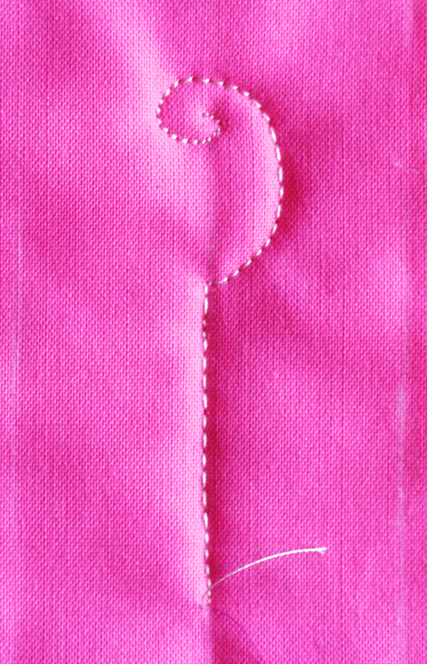 From the stopping point on the center line…stitch a left-sided semi-circle to close the tulip. 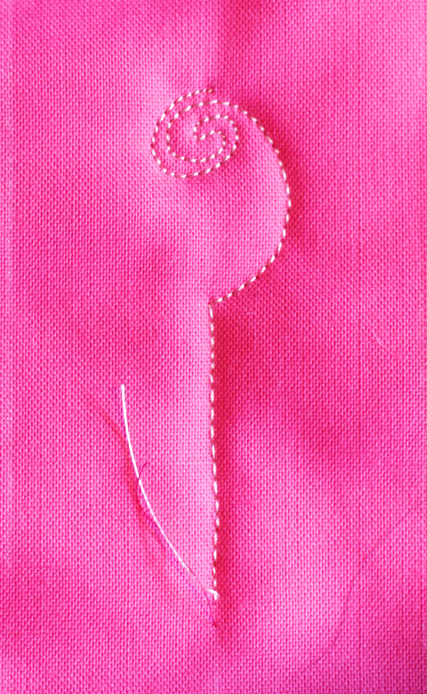 Stitch down the stem and you are now ready to stitch The Figure Eight Leaf. It looks rather cute all by itself don’t you agree? 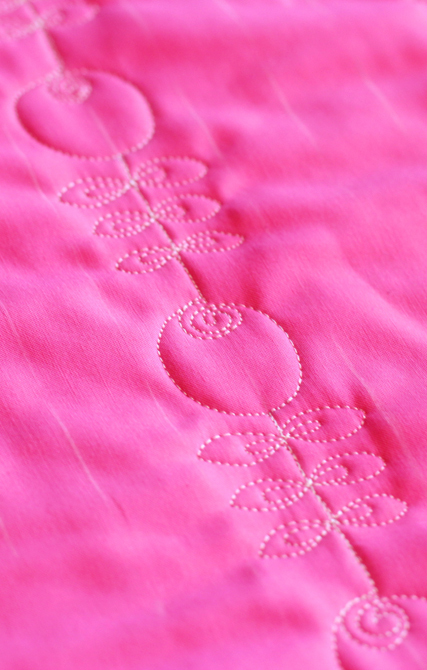 I hope you will incorporate The Tulip and The Figure Eight Leaf into your next quilt! Or, use it for a “vase quilt” as I plan to do! 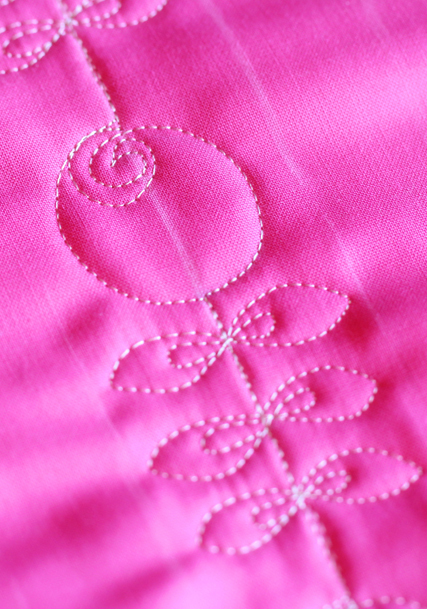 Tune in later in the week–I have a few design tips for you and I hope to have this little gem finished–I have some pink peonies in my garden that would look great on a Tulip Vase Quilt-–Wait! That doesn’t seem right, does it? Maybe, I’ll have to design a peony quilt for my peonies…and arrange tulips on my tulip quilt…but what about my Bachelor’s Buttons??? This could get out of hand very quickly! Love this one, so pretty. It would look nice in one of those small borders I never know what to do with!! It would look great in any border. 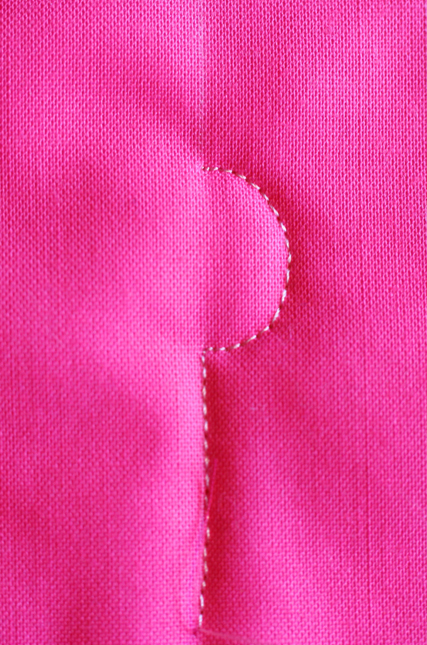 In the corners, you could stitch a single tulip angled in or out. Let me know what you do! Thanks, Jane! Very encouraging to hear your kind words! Great design! I also like the step by step tutorial, wonderfully clear. Glad you like it! 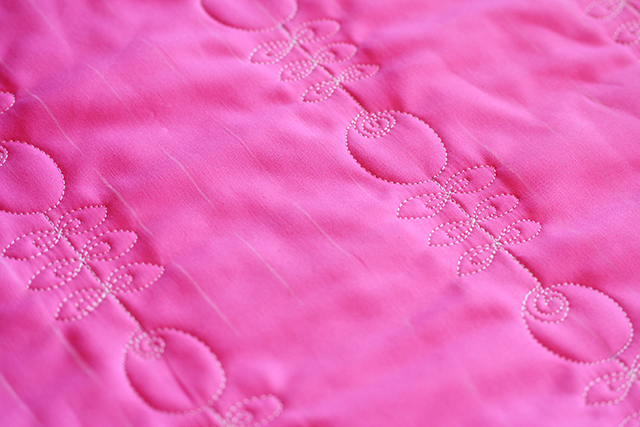 Hope you can use it on a quilt soon! Ooh, I really love this one…still not had chance to give it a go…must make time! Oh, this is so lovely! I’ll have to give it a try. Thanks for sharing. At first I thought, Oh no I can’t do that. Then you broke down the steps, now it is WOW! I can do that. Thank you. Of course you can! Can’t wait to see yours! Thank you so much for your ideas. I am always forwarding them to my sister. I’m so glad I found your blog. You help male the steps in each design just great. It was so simple at first I didn’t follow we’ll. I can always use help in getting my confidence up, I have a longarm but we don’t spend very much time together. I practice all your designs but with pencil and paper. 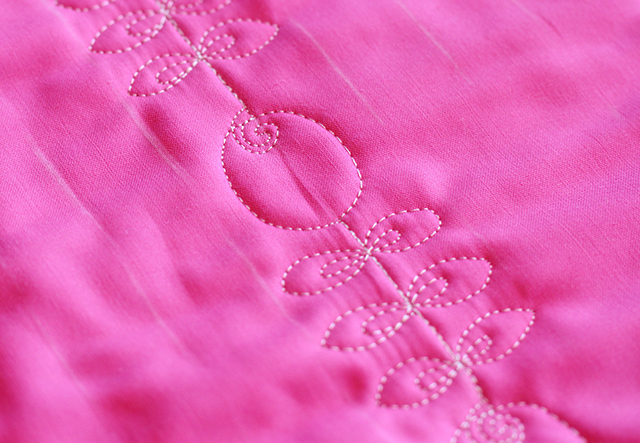 It’s a great idea to practice on paper first–then your stitches will flow much more smoothly. Your designs keep amazing me. And you are so generous with your tutorials. Thank you!